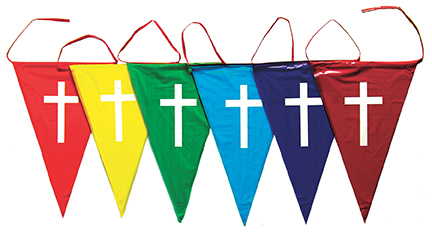 Colorful rainbow pennants make any space fun. 48 plastic 18" pennants. 100' long. 1 piece. Perfect for using as a decorations for your next fall festival or outreach. TIP: Easy and safe to hang from any grid ceiling panels. Just use our extending, telescopic, twist-and-lock Hanger Pole.